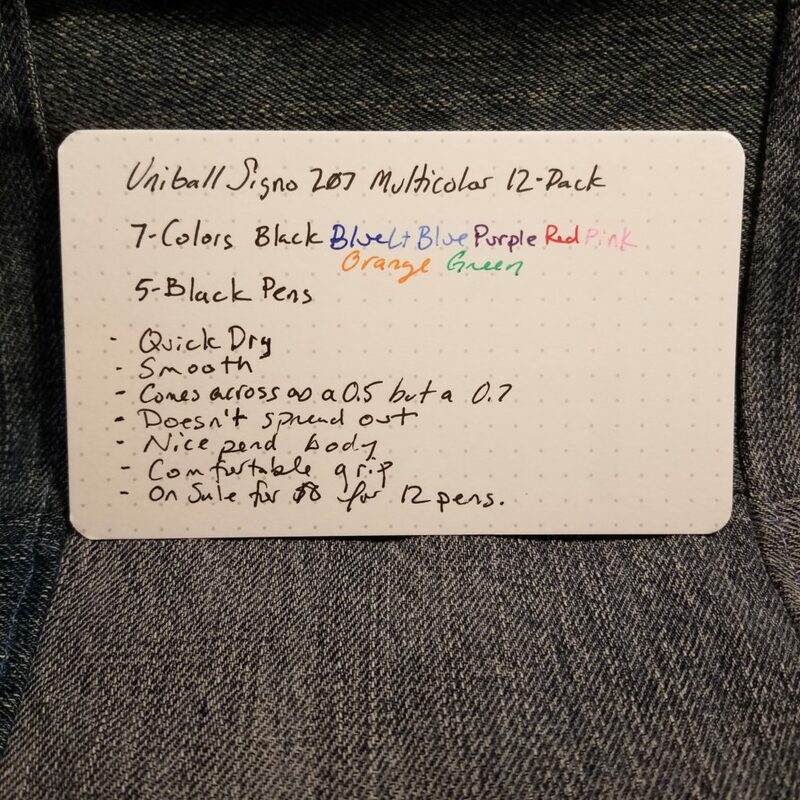 The Uniball Signo 207 is a staple pen. You can pick one up at any office, box, drug, or grocery store in the US. The multicolored sets are available at office supply stores across the US. A standard multicolor pack includes red, blue, and black. There are a total of 8 colors. 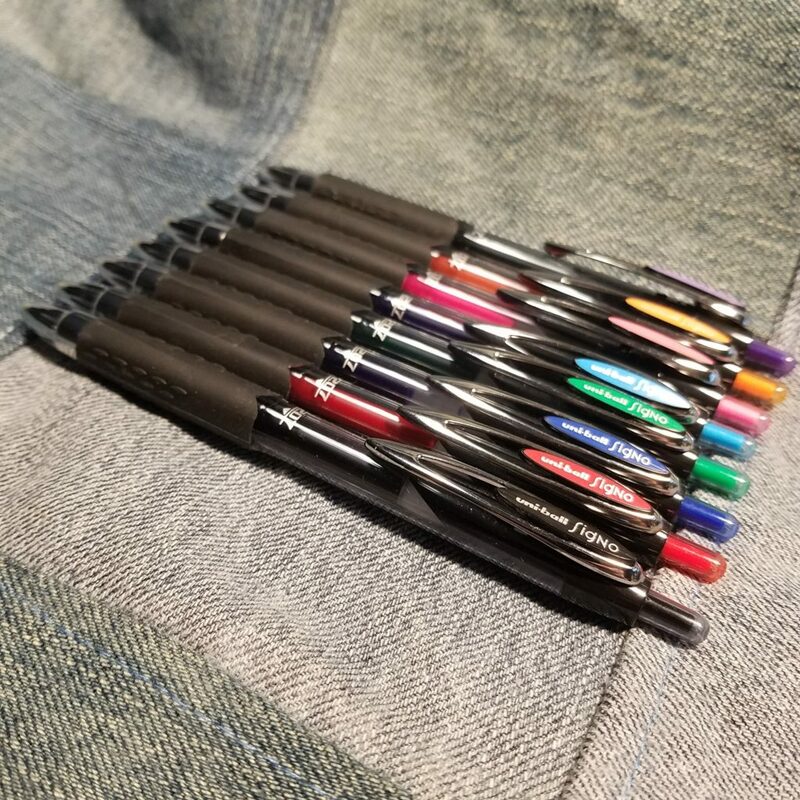 5 of those colors are only available in the 0.7 or medium point. The colors are identical across their range of gel inks, so if you want to sketch with a SIgno 207 then switch over to a Signo DX you can. This is great news if you want to sketch with these pens. 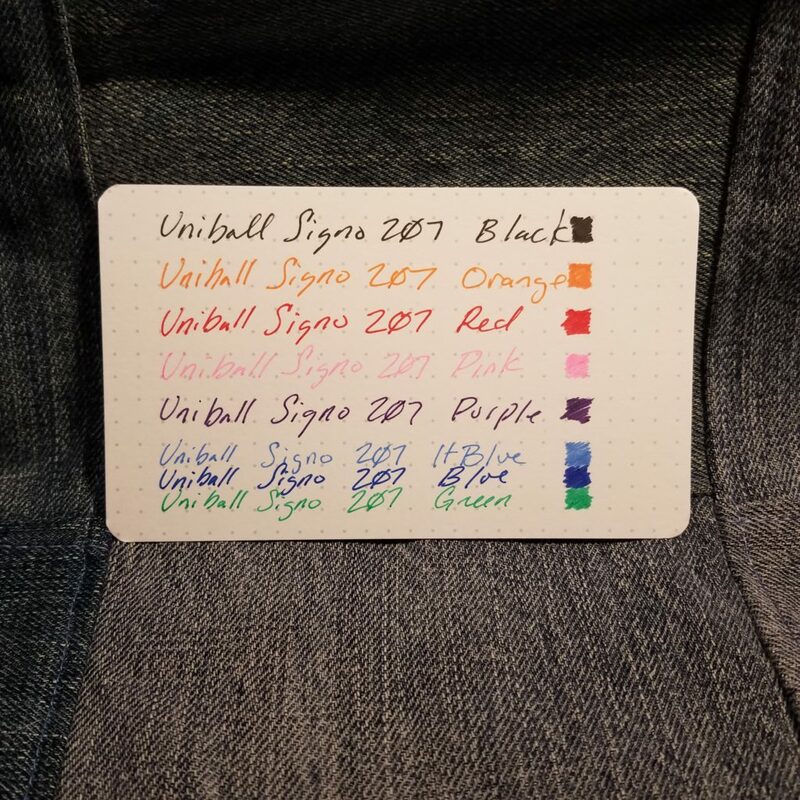 Uniball reports that the Signo 207 RT “forms an indelible bond in paper” and reports them to be “fade- & water-resistant, acid-free ink.” If you’ve been reading this blog for any period of time you know what I think about acid free claims. * Fade and water resistance are much more important for those of us who use these pens for sketching. 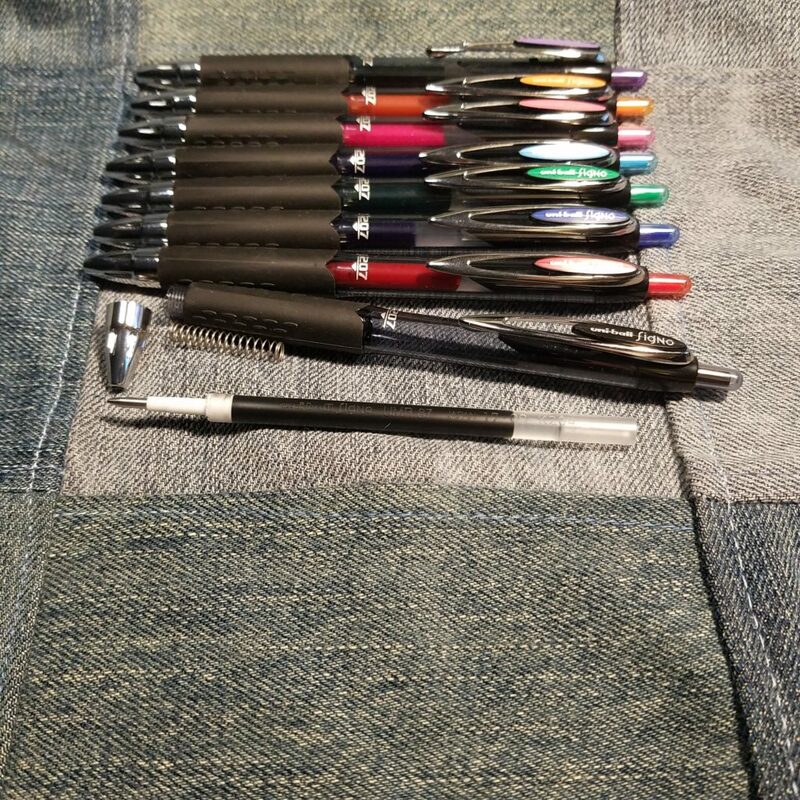 So a few things to note about these pens. 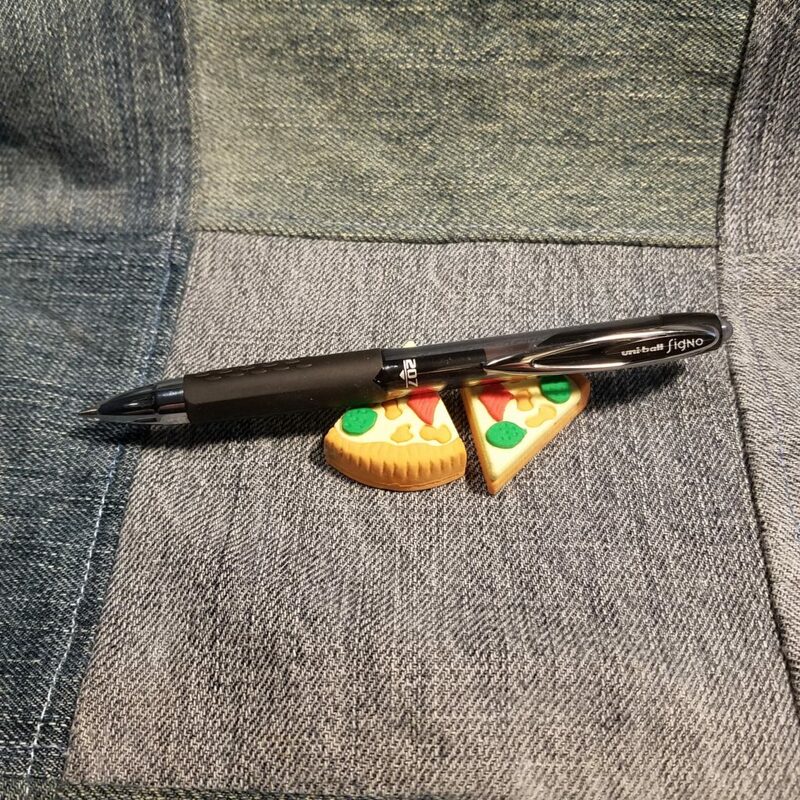 The black is a solid everyday pen- great for writing, making notes, bullet journaling, and sketching. I’ve recomended it over and over and over again. It’s a great pen. Additionally so are many of the other colors. However, when you use these pens on good paper the ink doesn’t bond well with the fibers of the paper. So when you add water, or highlighter, it lifts and smears. I have found that this is much much worse with the colors, any of them. The black adheres the best of the lot, but every other colors I’ve tested with a variety of highlighters, smears. Adding water causes lifting and bleed of the ink. Sketchbook paper with less sizing does well. My Leuchtturm1917 didn’t fare well. The ink smeared and I had to use a blotting sheet to keep the ink on one page. 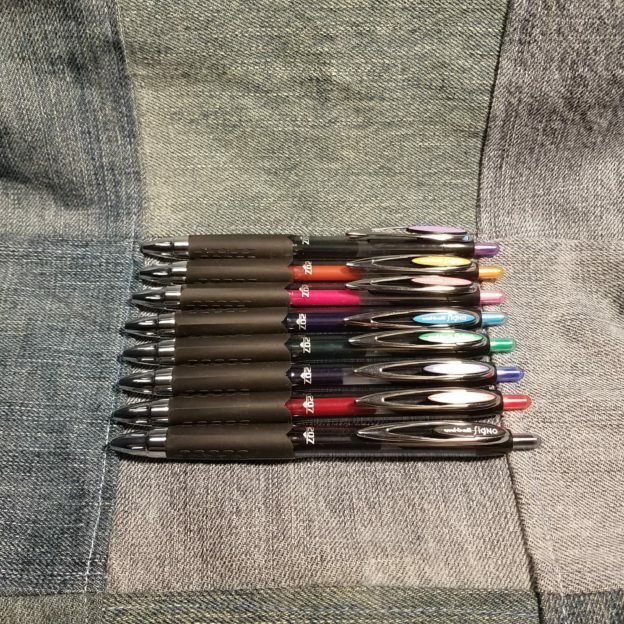 The colors are great for bullet journaling but not in a Leuchtturm1917. Overall, I find the colors great for sketching and writing. I can use the bright red or orange for calling out a note or coloring a box. Further, the writing experience remains smooth and enjoyable from first to the last click. The ink is great on crappy paper, it bonds well but doesn’t drain out of the pen. I also enjoy these for sketching but the water-resistance of the colors is less than that of the black ink. Use the variety of colors combined with water with caution. Test first. This entry was posted in Review and tagged 207, gel, ink, signo, sketching, uni, uniball on 20181127 by leslie.